I am waiting for it to be available on WIND Mobile at, hopefully $99.99 for 3-year. Samsung Galaxy Nexus’ “fortified glass” has load bearing capacity of 72 pounds? We know that “Samsung Galaxy Nexus confirmed to have ‘fortified glass,’ not Gorilla Glass“. And we also know that Samsung and Corning has a joint venture call Samsung Corning Precision Materials Co., Ltd., so they do work together. Now, I wonder/guess/speculate, based on this video of “Corning Gorilla Glass2 demo at CES 2012“, if Galaxy Nexus’ “fortified glass” is the type they used in the demo which has a load bearing capacity of 72 pounds? Note: In the demo, the damage and scratch resistant Gorilla Glass1 has a load bearing capacity of ~125 pounds and Gorilla Glass2 is 20% thinner and offer the same damage resistance as Gorilla Glass1 with load bearing capacity of ~125 pounds. Am I right? Can someone help me prove that I am right or wrong? I will be happy to be wrong if I can know the spec or more precise info of the Galaxy Nexus’ “fortified glass”. More news media reprinting, quoting, excerpting the above reports Financial Post and G&M . “Wireless newcomer Mobilicity is planning to launch an initial public offering early in the new year with the goal of raising up to $100-million. 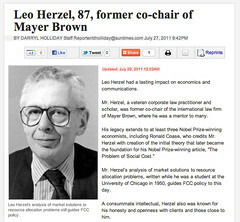 I’ve heard of Leo Herzel (via Prof. Ronald Coase and others) for some years, it was only yesterday that I finally got around to read his “My 1951 Color Television Article” (The Journal of Law & Economics, 1998) that talks about his original 1951 thought provoking and influential idea and analysis. Leo passed away on July 21st, 2011. See obituaries from Illinois State Bar Association and Chicago Tribute. For the record, I am reposting my Aug 23, 2011 Google+ posting where a telecom lawyer took time to explain the legal problems of BART shutting down cell services. A link to Aug 28, 2011, Washington Post, “Public safety, technology and the First Amendment collide in San Francisco’s subway“. KGO News Talk, AM 810, “Commuter Beware: Another Protest Scheduled for Monday in SF“. Ref, Aug 24, 2011 Special Board Meeting. It took 16 months for Xplornet to conform to the CRTC’s disclosure demands. But they weren’t ignoring the CRTC—they were in constant communication during that time. When they did finally tell customers what they were doing, it was after the CRTC threatened to haul them into a public proceeding—but that’s not why they did it. They degraded the speed of a competitor’s Internet phone service (VOIP) to the point where it was unusable—but they did so by accident. It was a technical problem with a codec. You are currently browsing the archives for the Telecom category.